This week we are pleased to bring you a guest post from GCU artist Stephanie Laird. Stephanie has been doing some housecleaning and has some excellent advice to share with her fellow GCU artists. Hello! I have been having a great time updating (and deleting at times) some of my old cards or cards that have no to low sales. Editing existing cards is a wonderful opportunity and I encourage you to take advantage of it. It has been working quite well for me. It’s so rewarding to receive the “Artist Services You’ve Made a Sale” email shortly after you’ve updated a card to find out that it has just sold! A little success story of mine. The very first card I submitted to GCU back in 2009 had very few clicks and not a single sale. I updated it, asked the review team to look it over, and within a week 3 were sold! From no sales in 8 years to 3 sales in a week. Exciting! There are great advantages to updating your older cards or no to low selling cards. There is no submission process as they are already approved and in the system. You can ask (and should) the review team to look over the changes you’ve made (a brief email with the pid#(s), note of what changes you made and a polite request for a re-review is fine). GCU Note: the email subject line of “Updated Card Re-review Request” would be appreciated. The review team is quite helpful and have a great eye for detail. 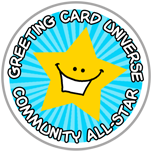 I felt like I was bothering them on such tiny details but they are very kind about it and truly help you create a better card. Due to the store size limits another advantage is that you don’t use up a new card submission when you are updating an existing card. And lastly, when your cards are of better quality, it simply just makes your store look better. Ok, now onto the tips. This is what I look for when updating cards. Clicks. If there are low clicks there can be multiple reasons. Your card metadata isn’t serving your card well (keywords, card title and Artist Notes) or the cover image itself just might not stand out very well. It can be as simple as the orientation of a card running right to left vs. left to right. Below please see the equine sympathy card before and after and how it flows much better in the After flowing left to right. I started receiving sales just by flipping this image. 2. Clicks but no sales. As the saying goes “the cover makes someone look at the card, the inside makes them buy it”. So, that could simply be changing the font, size or color of the inside text, or wording it a little differently so it flows better. So many times I click on an old card of mine and wonder, what was I thinking? The review team is great at checking to make sure you don’t have a typo. I am often surprised how many they find typos on my cards that I did not see. 3. Sales, but not recently. Check your Artist Notes on that one and make sure that you get a green thumb. If you don’t have the green thumb your card will get less exposure. Here is a guide on Unique Artist Notes which serve as a product description. GCU Note: There are two additional considerations that can be a culprit to declining card sales. First, an older card that enjoyed sales in the past may be losing sales over time to other newer cards entering the category. Wise to look at how your older cards are holding up compared to the newer ones in the same category. Second, if you chose to keep your images watermarked this could be deterring shoppers relative to cards without watermarks as well as reduced search engine exposure and ultimately sales, see here for the Watermark Changes. So the next time you get a little creative block, can’t think of a new concept for a card, or just want to have some fun resurrecting a good card idea, go through your older cards or no to low selling cards and see what you can do to improve them. Then drop the review team a brief email asking them to check out your updates. There are guidelines on updating existing cards, please be sure to check those out. GCU Note: See related post Change or New Submission for tips and guidelines. You can’t edit a card into something totally different but you can improve the existing card. Most of all, have fun and watch as your sales increase with just a few corrections. Thanks for reading! Wonderful advice and tips, Stephanie! I too have been updating old cards – have been for a year and I’m still not done – but you are 100% correct! The results in sales is nearly immediate! Thanks so much for sharing. This may be the push I need to really get down to business in this area! Thank you Stephanie, Wonderful advice and tip!